The six fully-extending and soft-closing drawers of the Broome Dresser accommodate your wardrobe in true mod style. The exotic latte walnut veneer is offset by brushed steel drawer pulls and a distressed HPL concrete shell in this feat of urban architecture. 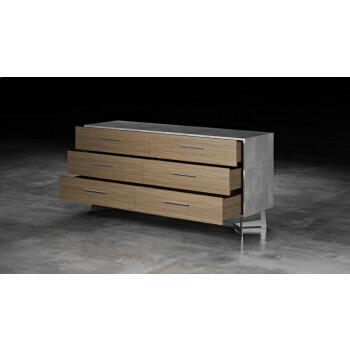 Brushed steel legs hold the dresser several inches aloft, and join together underneath to form a solid and stable base.